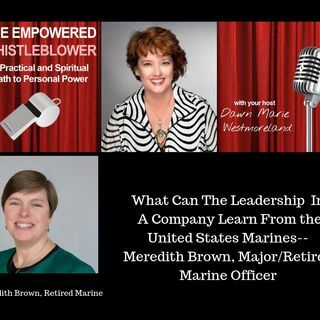 Meredith Brown who is a retired Major from the United States Marines shares her advice on how leadership traits in the Marines could also benefit companies and organizations. While on active duty in the Marines, Meredith experienced sexual harassment, which was dealt with quickly and professionally by her leadership. She shares how the culture and lifestyle of the Marines shaped her to become an effective leader. Listen in as Meredith points out how leaders can create safer and more ... See More respectful work environments.